Sally's Sea of Songs: Music Teacher Freebie Finds! 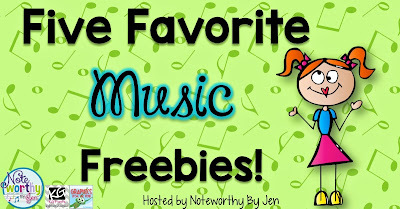 Today I am linking up with Noteworthy by Jen for Five Favorite Music Freebies! Who doesn't love a freebie? These fabulous teacher-authors have offered some of their work as freebies. Let's see what we can find! 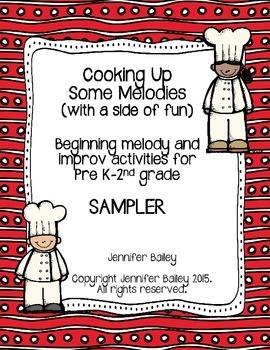 Cooking Up Some Melodies (With a Side of Fun) by SingtoKids is a great way to get kids thinking musically. I realize that I spend too much time asking kids to echo and "be the same as me." I need to get kids using the patterns and melodies that we have learned to create their own music, and "be different from me." Jennifer's songs are so creative, and the activities are wonderfully age appropriate. This freebie is just a sampler of a larger product, which is also great! Tchaikovsky Staggered Book Freebie by Rhythm & Bloom will be a great addition to my 3rd grade Nutcracker unit. It has just the right number of pages and facts about Tchaikovsky presented in an engaging format. The other benefit will be that this could go into my sub tub because we all know that I will get sick sometime during the fall, and my students will have the benefit of working on relevant and interesting project! 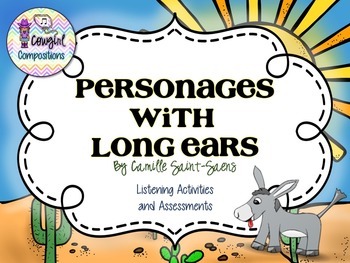 Personages with Long Ears Listening Map by Cowgirl Compositions is so cute! The animated donkey, hopping up into the air will keep kids engaged! The music is not included for copyright reasons, but I had no trouble inserting my own sound file on that page. (I did have to click on the animation tab, and move (reorder) the sound file to the top of the list so it plays first, before all of the donkey jumps.) My students will love this one! 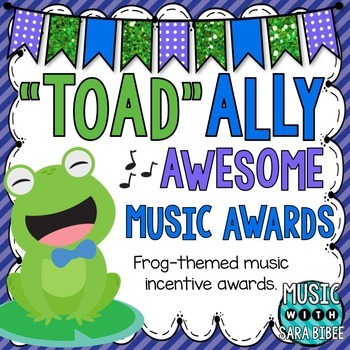 "Toad"ally Awesome Music Awards by Music with Sara Bibee are great little classroom awards. My students seem to need extra incentives in the spring time! This cute little set has several frog-themed sayings, such as "You had a 'TOAD'ally awesome day in music class!" To make this extra special, there are also blank cards and an editable PowerPoint version so I can personalize the awards just for my kids. This Year Rocked! 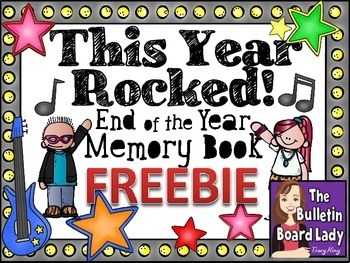 End of the Year Memory Book Freebie from The Bulletin Board Lady Tracy King is an easy to use activity. Just print only the pages you wish to include, and you are ready for class. While this is not music class specific, and could be used in a regular classroom, the cute rock music theme works well for me. My district supports the arts with one fine arts field trip per year for grades 1-4. I'm definitely using the "Rockin' the Field Trip" page! Here is a freebie from my store! 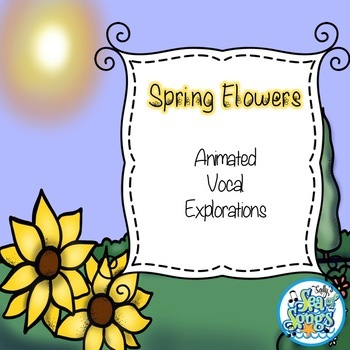 Spring Flowers Animated Vocal Explorations PowerPoint and Worksheet will help you young students explore their voices in a guided manner. I am convinced that doing regular vocal explorations, insisting that students use their singing voices, and find their high, light range has made my students better singers! The animations include a butterfly, bee, and a grasshopper, and will only work when in presentation mode. One printable worksheet is included to encourage students to create their own pathway and follow it with their voice. I hope you have enjoyed reading about these freebies! Let me know about your favorites in the comments, and be sure to check in with Noteworthy by Jen's linky party to find out about more great freebies! Los Machetes - Folk Dance Fun! Visit Sally Utley's profile on Pinterest.